Tai Chi is a Chinese form of exercise in which pensioners gather in public parks and spend several hours moving various limbs as slowly as possible. According to TUCK (Tai United Chi Kingdom), the benefits of regular sessions include improved circulation, increased resistance to coach trips and repeat appearances on Countdown. Feng Shui is a related form of exercise in which pensioners gather in each other’s homes and spend several hours moving the furniture around. 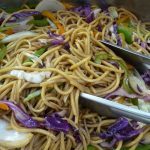 Chow mein is entirely different and involves noodles.